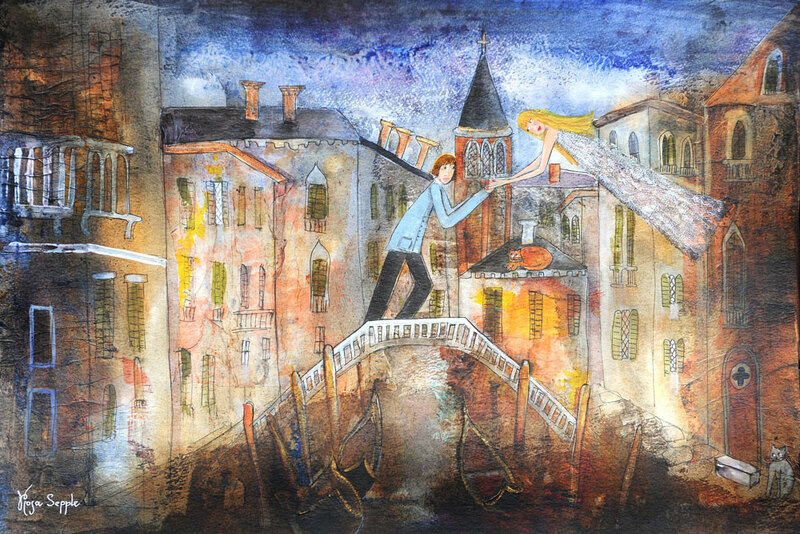 Our new Reception Selection features work by the award-winning young artist, Bernadett Timko, whose practice spans everything from painting and sculpture to etching. 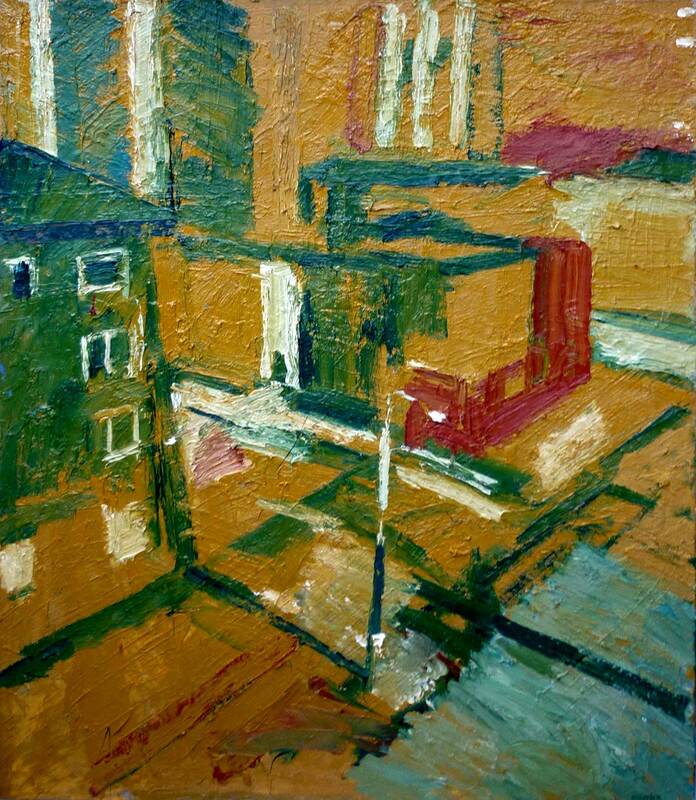 Here, Bernadett tells us about her childhood in Hungary and the steps that led her to become an admired London artist with an instantly recognisable style. You were born in and grew up in Hungary. What was that like, and why did you decide to move to London? Growing up in Hungary was quite nice, especially in my early childhood as I spent a lot of time surrounded by nature. I always lived close to forests and mountains; I was a very introverted kid so that kind of environment suited me. In my early teens I had a difficult family life because of my alcoholic father. 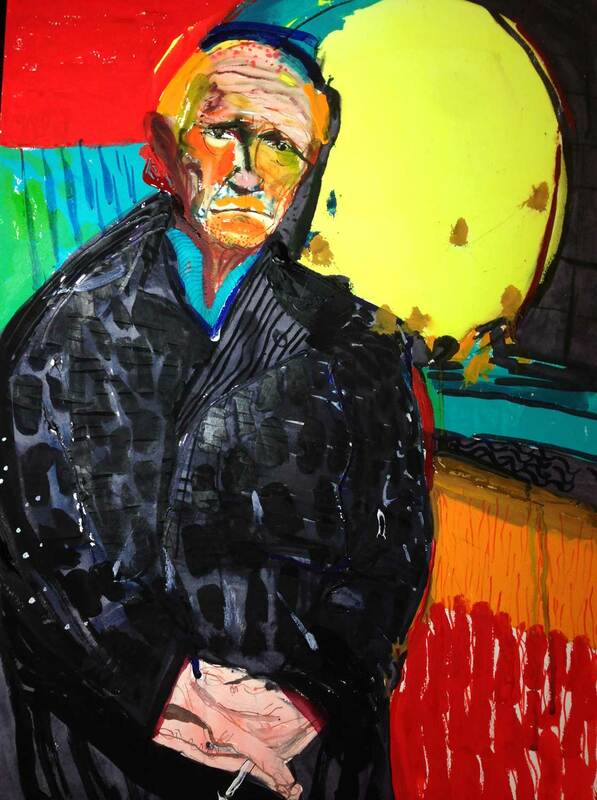 My mum divorced him when I was 14, and then my mum, big sister and I moved to a city where I studied drawing and painting for four years. It was after this that I decided to move to London, not just to study but to start my own independent life and leave a lot of things behind me. I felt like an outsider in Hungary and I needed to be somewhere with freedom to live and grow spiritually. I knew I’d return to my studies, but to begin with I hardly spoke any English and worked full-time to support myself. 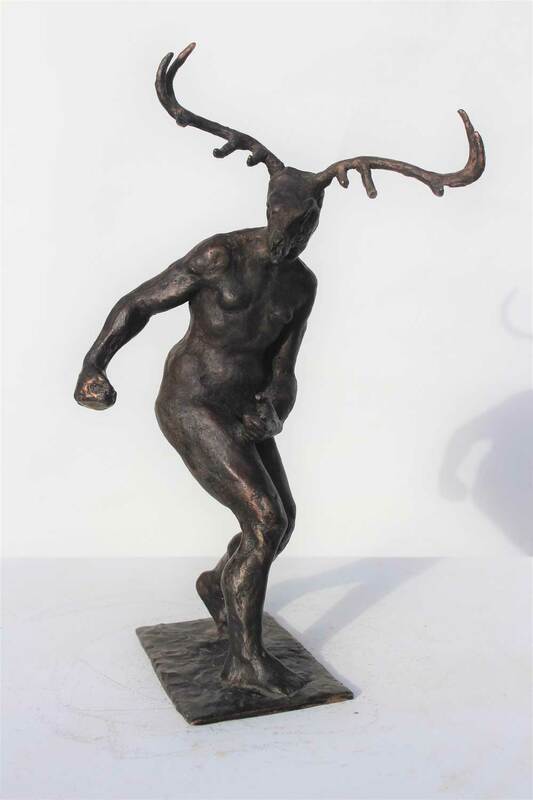 You have diplomas in both Figurative Sculpture and Figurative Painting. How have these disciplines influenced your learning and development as an artist? To be honest I learnt more about drawing and painting in Hungary than in London, but I still had a great experience at Heatherley’s. I had my own studio space, could use all of the facilities, and got to know some great tutors whose art I love. I learnt about printmaking, which became a big passion of mine, and then sculpture, which helped a lot with my painting. I became more expressive and learnt to appreciate the processes even more than before. 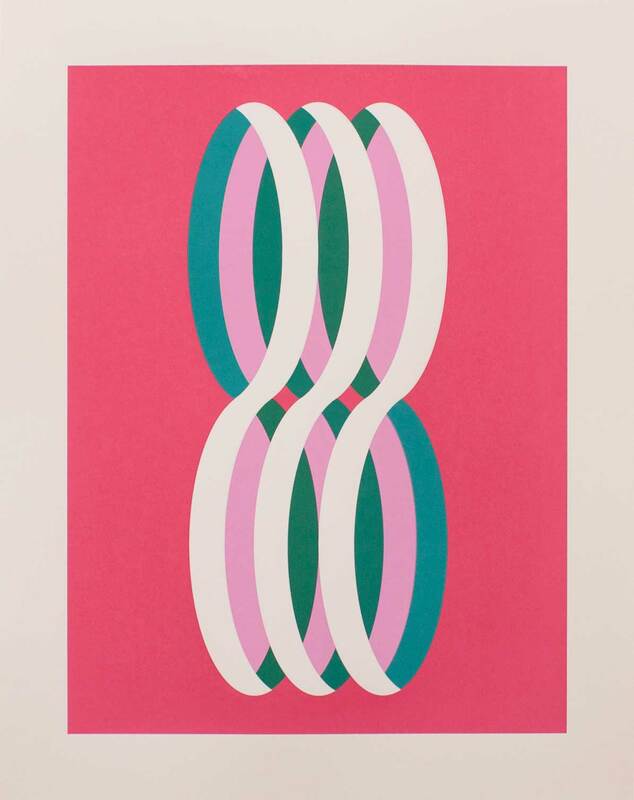 During my studies I spent all my time in the studio; the constant practice gave rise to new ideas and perspectives. For those unfamiliar with your work, what are your main influences and how do you approach your subject matter and colour palette? My main influence is the magic of ordinary, everyday life. Faces and places, light and mood inspire me to capture feelings from a particular moment in a painting, still life or etching. I look for inspiration everywhere. My colour palette tends to be dark, but I go through phases. Sometimes I don't have white on my palette at all, sometimes it comes back for a few paintings - like this reception selection. I appreciate the richness of dark tones more than vivid bright colours, and I like a sense of the melancholic in painting. You produce work across a range of media. Is there one which offers the most creative fulfilment? Each medium offers me something different. I feel most creative when I paint, most free and strong when I sculpt, and most peaceful and focused when making etchings. How did you find creating the new works for the Reception Selection given the precise measurements of the space available? I always have different sizes of stretcher bars in the studio, and different sizes of canvasses inspire different ideas; they almost tell me what to paint on them. 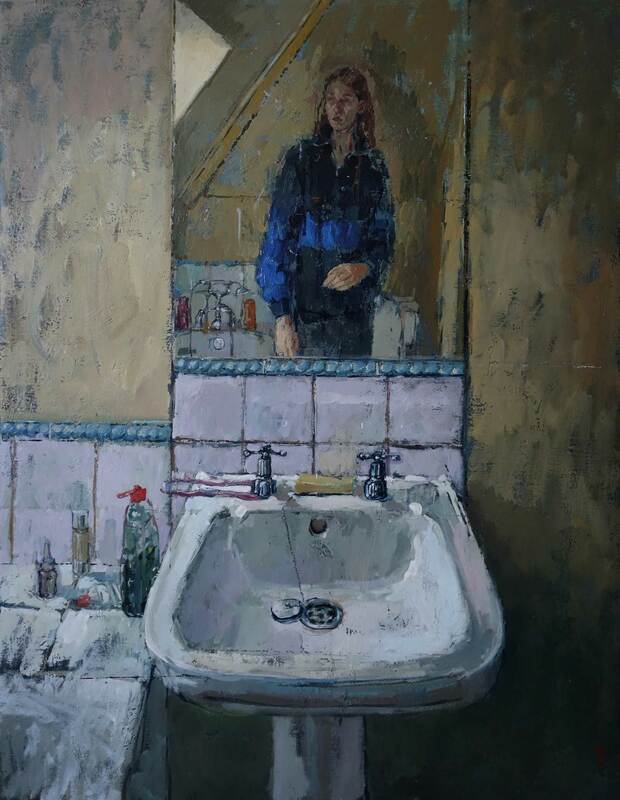 You exhibit widely and have won many awards, most recently The Phyllis Roberts Award and the Winsor & Newton Young Artist Award (Second Prize) at the Royal Institute of Oil Painters Annual Exhibition 2018. How do such accolades impact your practice? They definitely make me work harder to achieve even more and win even bigger prizes. It’s humbling to know that other artists and art lovers appreciate and support what I do and think that my work is worthy of that recognition. It started when the German painter Albrecht Durer discovered that watercolours were an ideal medium for his botanical, wildlife and landscape sketches - Durer’s Young Harebeing a well-known example. After Durer, other famous artists such as Van Dyck began using watercolours for quick sketches drawn from life, often with the natural world as their subject. 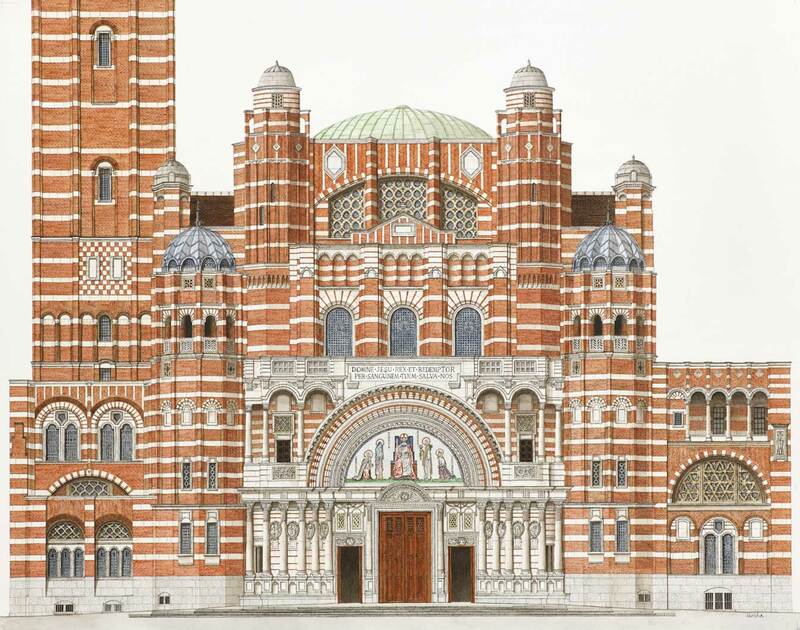 Watercolour painting as a secular art form quickly spread to the United Kingdom, where it became particularly popular. By the Eighteenth Century, the education of an aristocratic man typically involved some training in watercolours. The medium’s ability to depict changing terrain made it incredibly useful for cartographic skills relating to warfare and the charting of newly discovered lands. Expedition parties to Asia and the New World would often recruit a watercolourist to document discoveries and create mementos of their voyage. Watercolour was also used to document life closer to home; the English cleric, William Gilpin, published a series of illustrated books about rural England. The immense popularity of Gilpin’s series saw watercolour painting become known as England’s ‘national art’. The Poet William Blake used watercolours in several books of hand-tinted engraved poetry, in illustrations of Dante’s Inferno, and in large experimental monotypes. The market for printed books was growing rapidly, and as it grew, the bound book became a collector’s item, and among the upper classes’ favourite things to collect - volumes of watercolours sketches. Although watercolour was now widespread, it was still somewhat confined to the page, whereas oil paintings graced the walls of Britain’s finest buildings. It was artists such as Paul Sandby ‘the father of English watercolour’, Thomas Girtin, and JMW Turner who elevated watercolours to the status of high art. These artists took a medium hitherto used for small-scale illustrations and applied it to large-scale epic romantic landscapes. The confluence of all these strands of watercolour painting in the UK led to the formation of several art societies dedicated to the medium, including the Society of Painters in Water Colours, and the New Water Colour Society. In 1831, several artists founded the New Water Colour Society to challenge the Royal Academy’s refusal to accept watercolour as an acceptable medium for serious art, and to compete with the Society of Painters in Water Colours by encouraging non-members to exhibit alongside them. 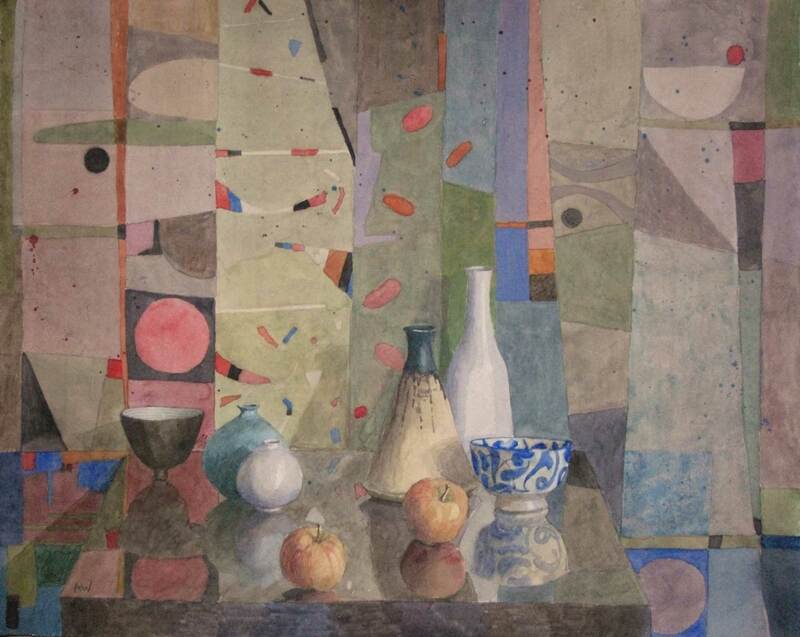 This society has since changed its name to become the Royal Institute of Painters in Water Colours, part of the Federation of British Artists and based at Mall Galleries. There have been many changes in the fine art of watercolour in the 187 years since the Royal Institute of Painters in Water Colours (RI) began. Advancements in materials and techniques employed by today’s artists has led to interesting, colourful and dramatic paintings. 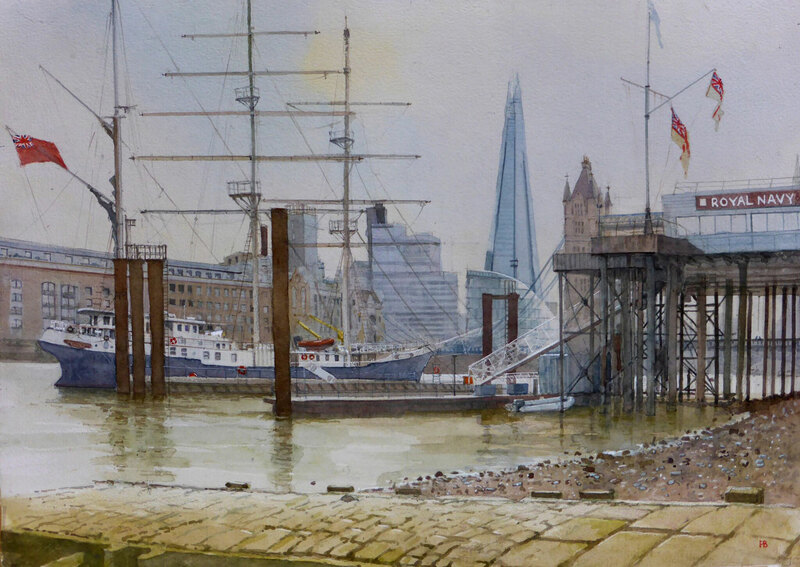 Since I became a Member of the RI in 2004, we have seen an increase in the popularity of watercolour paintings being purchased by private individuals and corporate public collections. This is reflected in the numbers of visitors to our annual exhibition. We are recognised as one of the best watercolour societies in the world and are continually looking for new Members to exhibit with us. 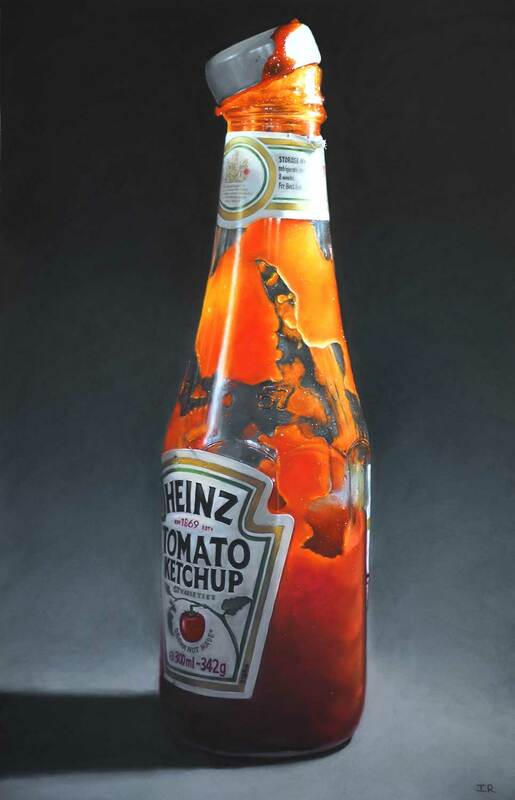 Rebecca Boyd Allen is an acclaimed American artist and representative of Winsor & Newton, who kindly sponsor the Royal Institute of Painters in Watercolours. 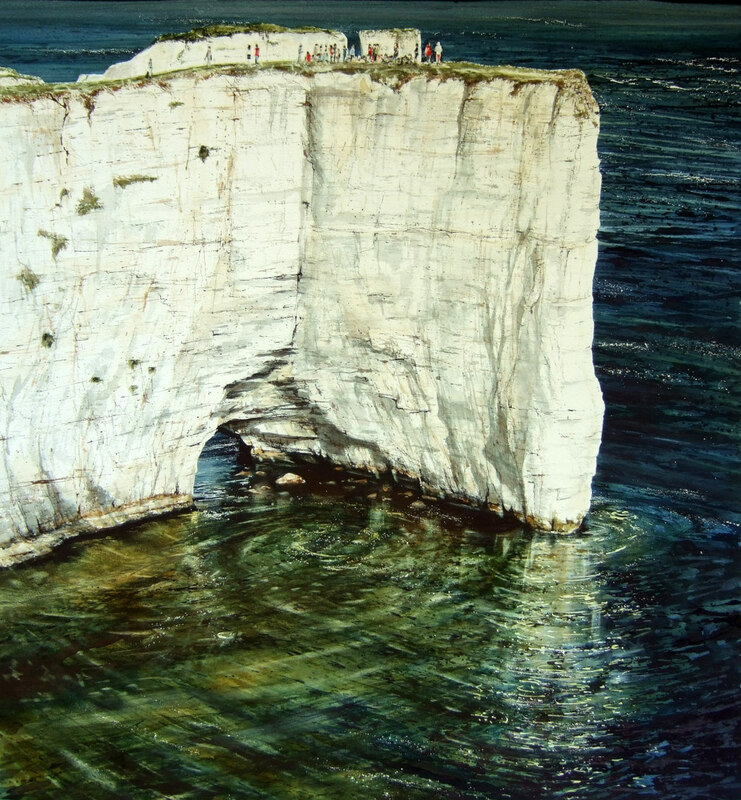 After graduating from Parsons School of Design in New York and the Slade School of Art in London, Rebecca now works closely with the ColArt team, of which Winsor & Newton are a subsidiary, to share her knowledge and experience of watercolours, testing new materials and demonstrating at art events. 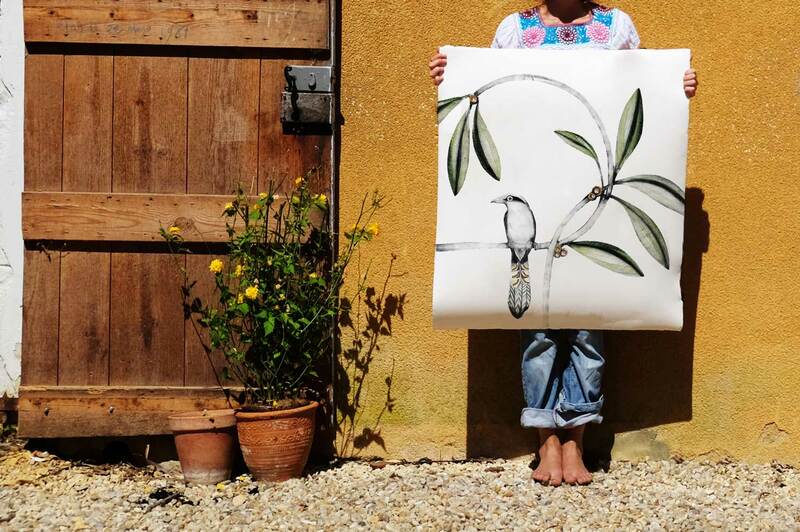 With the exhibition for the Sunday Times Watercolour Competition opening soon at Mall Galleries, we thought we’d whet your watercolour whistle by inviting Rebecca to take us through her favourite watercolour works on Buy Art. 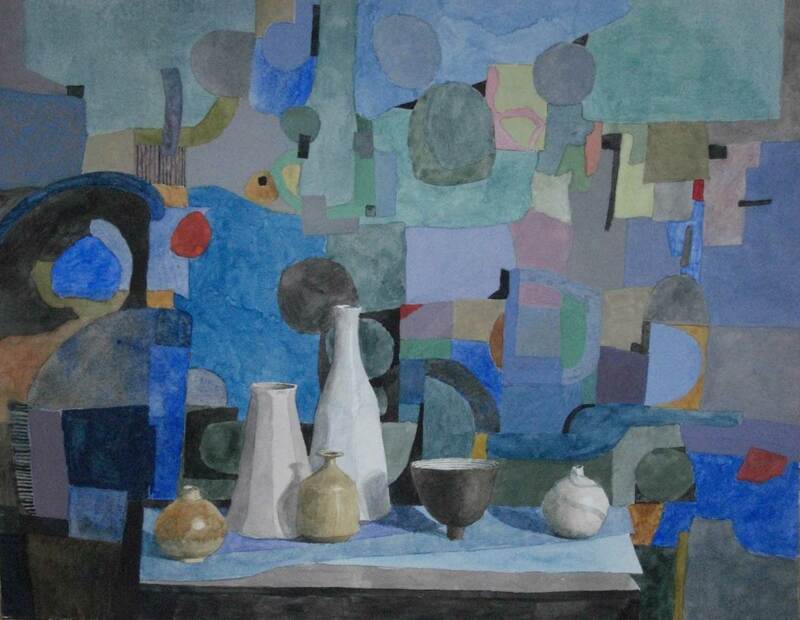 Williams' unique blend of abstract and figurative elements creates a virtually woven surface, with rhythms of answering curves and passages of tone dissolving the boundaries between the two genres. The peppering of dark dashes and shapes adds an additional all-over pattern which further unites the whole. 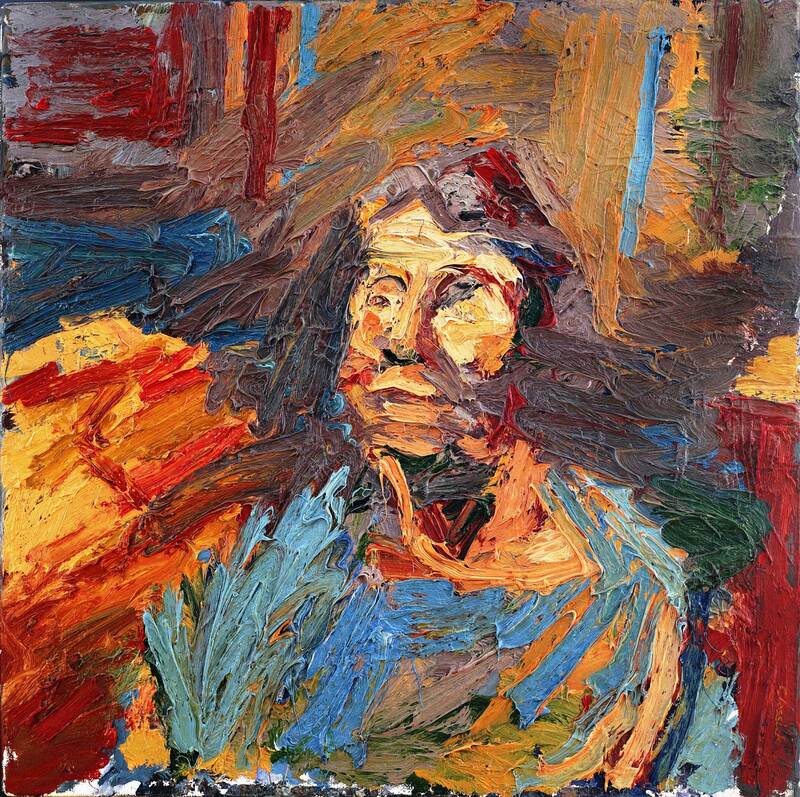 Ling’s portrait could exist as a colourful, balanced abstraction with a surface that celebrates expressive and varied textural marks. Lively colours pour from the background into the face and are off-set by bold grey shapes and an expressive line which she uses to deliver just the right amount of clarity to the features and hands. Using fragmented and cropped views in contrasting spaces, Panchal sets the viewer up to consider the reality of the model in an unreal and flat space of harmonious planes of colour. The white of the figure’s eye is like a remnant of the once blank paper, and it draws my gaze into a narrative which feels meditative and still. Albrook has seen a relationship between the rippling patterns on the rock and the waves of the sea. The eye is immediately drawn to the tonal contrast of the tunnel as it frames the lightest value in the sky. Simple mark-making throughout the painting is layered to create tone via colour, recalling the work of Impressionists like Monet. Classical compositional elements, such as the foreground “repoussoir” or push-back, allude to the clarity of space for the viewer. Banning merges the new and old London skyline by summoning an even light and balancing horizontals and verticals for a geometric focus. By contrast, the sway of the red flag on the left, implies an arabesque surface movement which is nicely counter-balanced by the shoreline. Sheldon has meticulously mapped out the overlap of architecture and nature in this study, which seem to celebrate the variety of negative spaces. Lit from above, subtle interior shadows pass into the sky, perforating the stark white frame of the glasshouse. 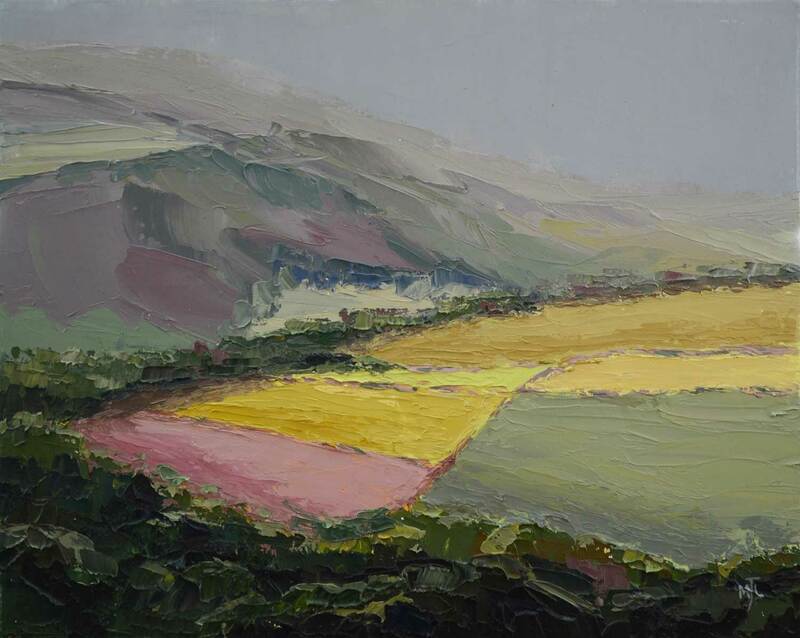 Each year, many talented artists apply to join one of the eight leading UK art societies which make up the Federation of British Artists, a major visual arts charity established in 1961 and based at Mall Galleries. Every society has their own fine-tuned process for electing new members, the yearly result of which is a group of new FBA members who are certainly artists to watch! 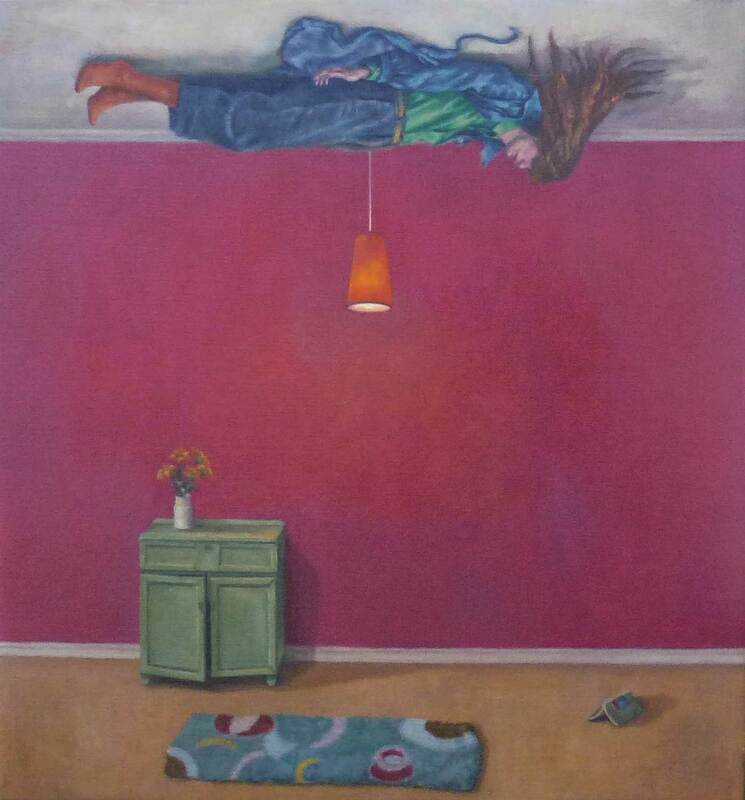 To introduce these individuals, Mall Galleries has created an exciting selection on Buy Art | Buy Now of work by the FBA’s newest additions. 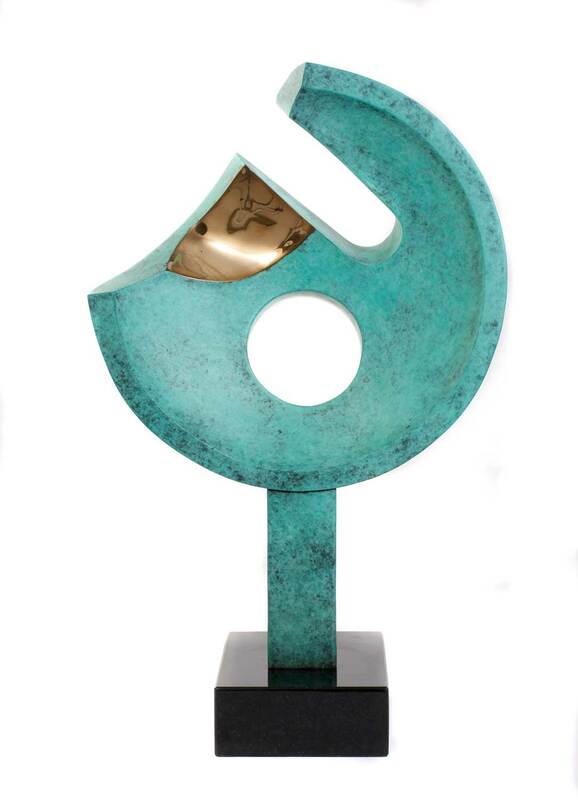 After showing his sculpture in the annual exhibitions and submitting a larger body of work to the society, David Sprakes RBA was elected as a member of the Royal Society of British Artists this year. “It’s an honour to become a member of such a prestigious society”, he says. The tactile sensory qualities of objects and environments, both man-made and natural, are constant sources of inspiration to David, in whose work the themes of abstraction and erosion recur. 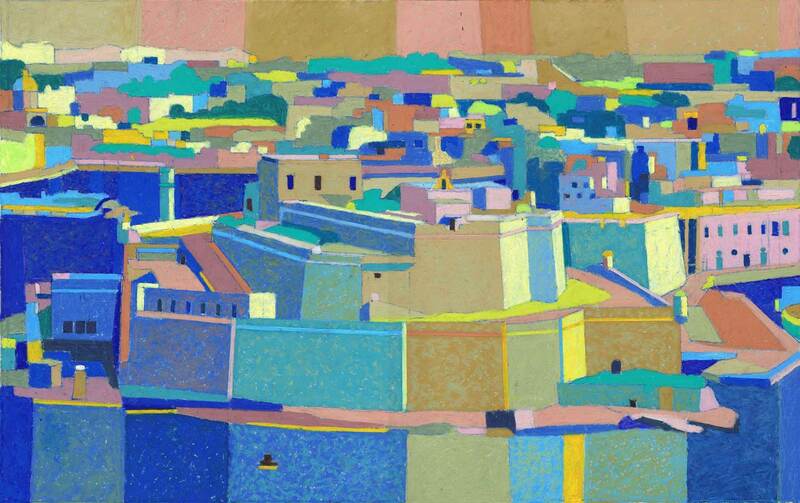 Richard Rees PS enjoyed a successful career as an architect for forty years, but oil pastels have always been his passion. He returns to pastels now with added vigour, having recently joined the Pastel Society. 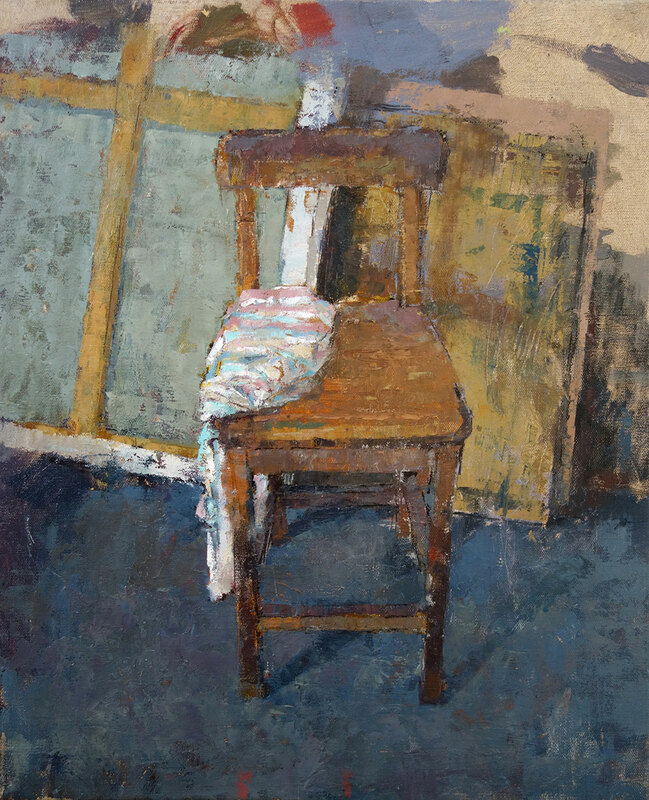 “Having now been elected a member of the Pastel Society, I have an incentive to develop my work further and I intend to continue to try new subject matter and techniques in my chosen medium” says the artist. 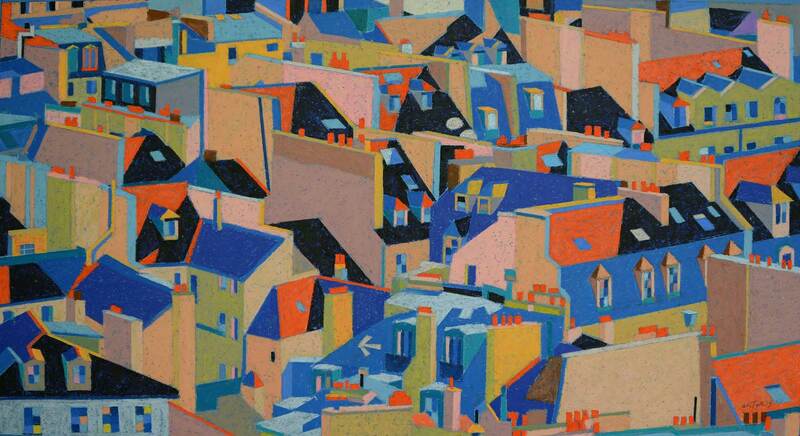 Richard’s work is inspired by his background as an architect. He creates urban panoramas, using bright and contrasting colours to infuse his images with the dynamism of the cityscape. 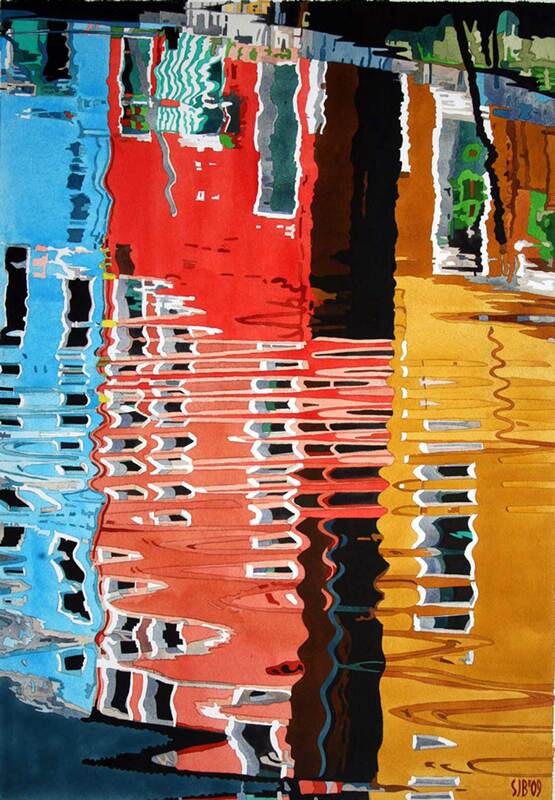 Varsha Bhatia RI, new member of the Royal Institute of Painters in Water Colours, is also an architect, but employs her professional knowledge to produce a very different effect. 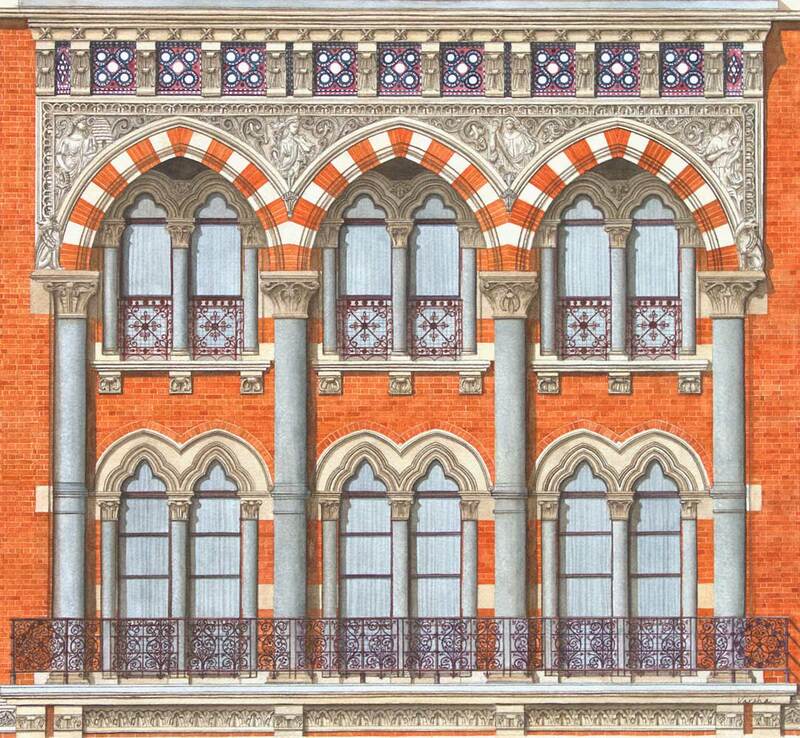 Varsha communicates the great beauty of buildings to her viewer through a meticulous attention to the finest details of a structure’s façade. 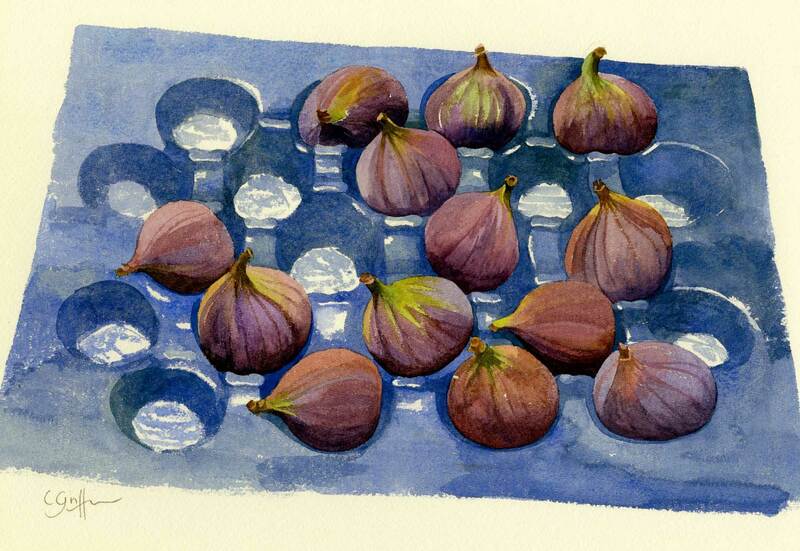 “Having always worked in watercolours, applying to become a member of the RI was my obvious choice. I have met quite a few RI members during the annual exhibitions over the years and have gained a lot by interacting with them. 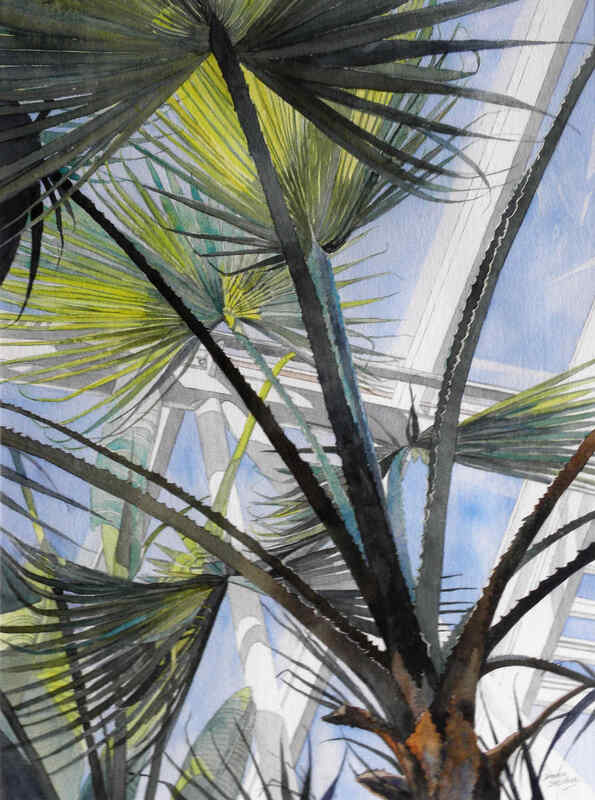 Becoming a member of such a prestigious institution has opened up opportunities for me to exhibit alongside RI members, who are some of the best watercolour artists”, says Varsha Bhatia RI. 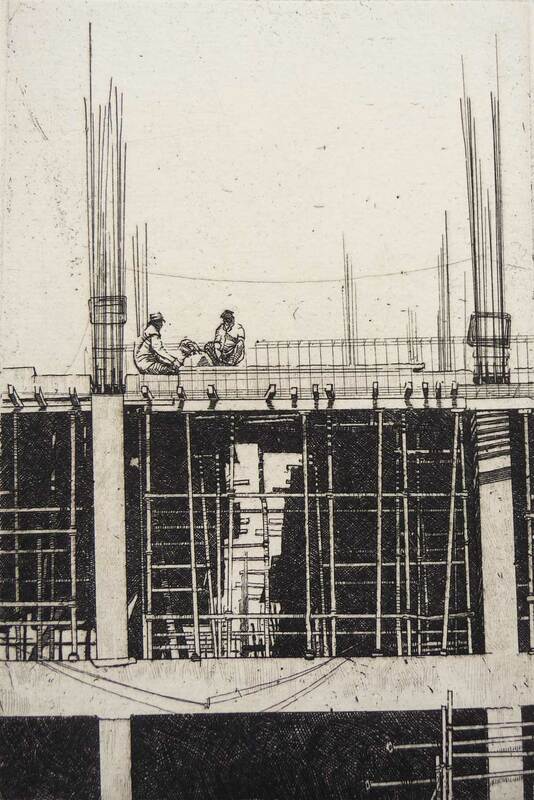 You might be forgiven for imagining that Will Taylor RBA is also an architect, with his penchant for depicting buildings in his stunning copper plate etchings. 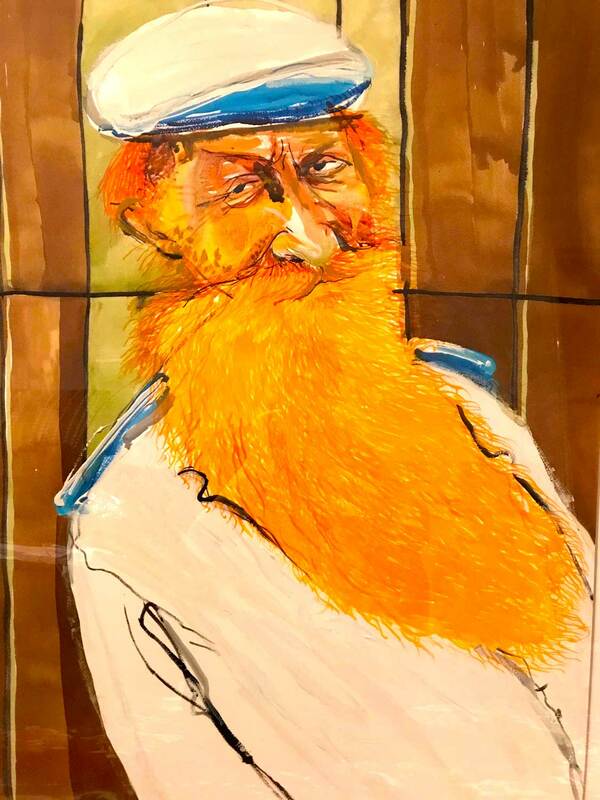 Yet Will is a largely self-taught artist with a background in Business Consultancy, going to show that talented FBA artists hail from all backgrounds. Will’s architectural artwork differs from Varsha’s and Richard’s, among other ways, in its introduction of human figures as interlocutors. 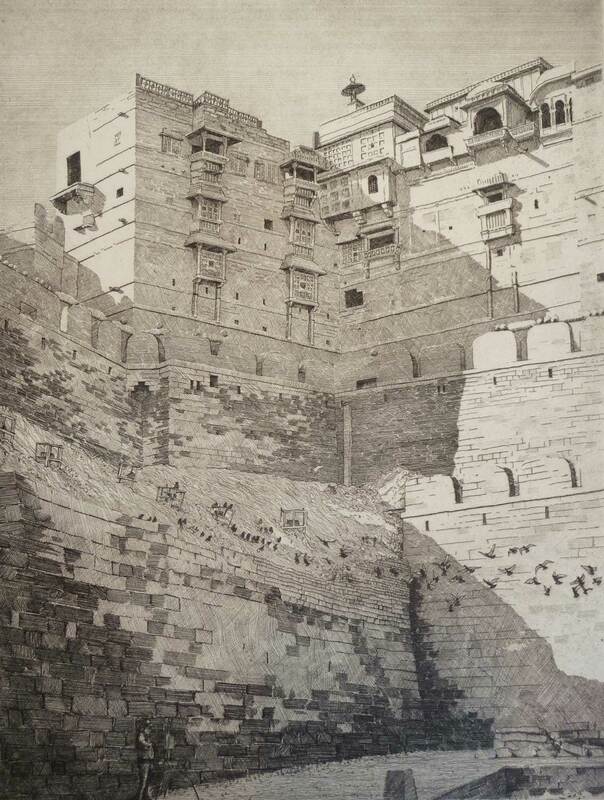 Buildings, or in the case of Jodhpur Construction building sites, achieve life and narrative through their utility, and the stories viewers imagine for the people residing within them. 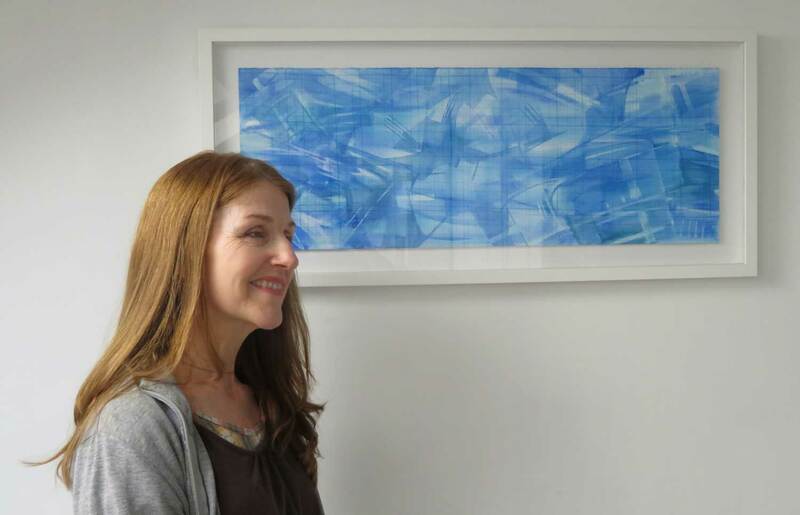 Another welcome addition to the Royal Society of British Artists is the expressive, semi-abstract painter Annie Boisseau RBA. 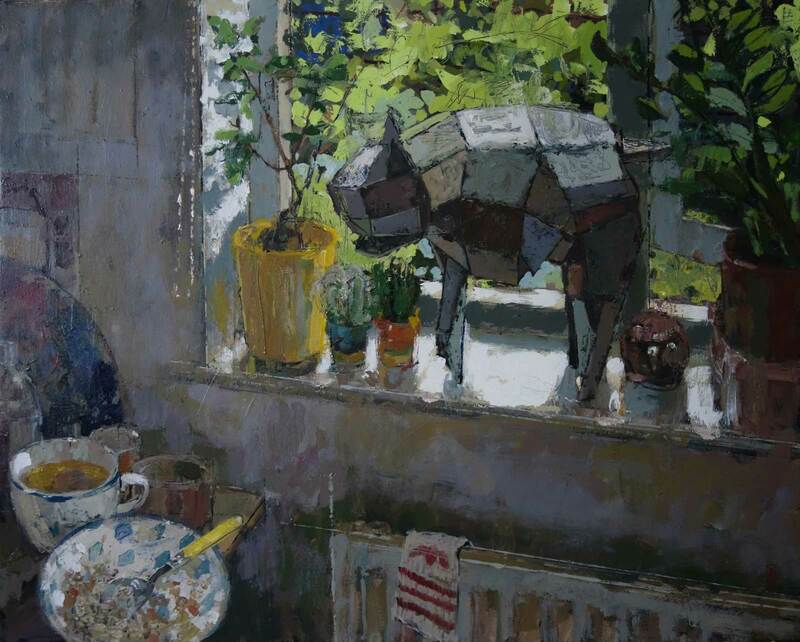 Annie has exhibited at Mall Galleries regularly for some years, and received the Winsor & Newton Award for painting at last year’s RBA Annual Exhibition. 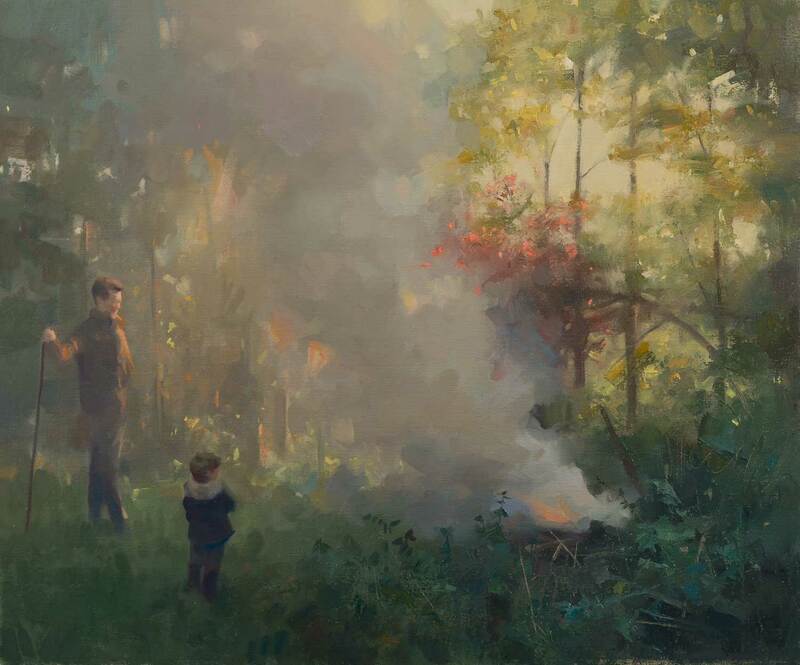 Annie conceives of her paintings as contemporary interpretations in the tradition of romantic landscape painting. They are inspired by an emotional response to the natural world, conveyed through surges of colour and the application in layers of transparent paint to create a sense of atmosphere. 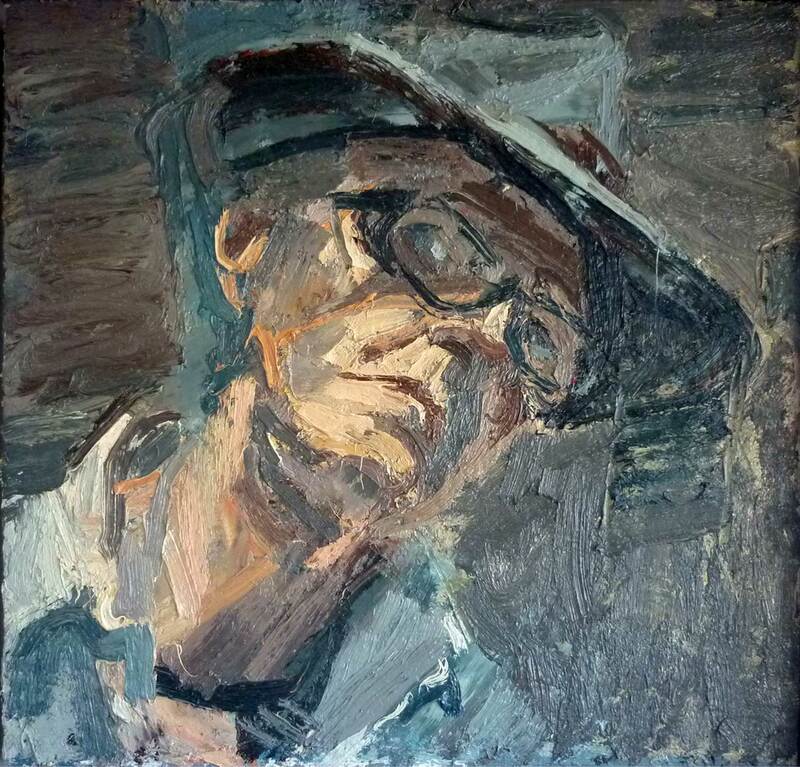 Frances Bell RP joins the Royal Society of Portrait Painters this year after contributing to FBA exhibitions for many years. 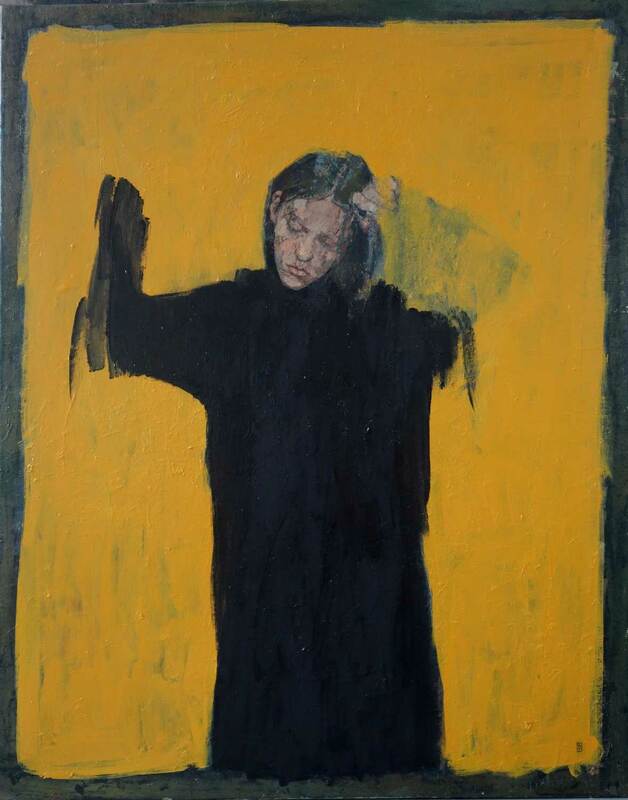 Bell has received numerous prizes such as the De Laszlo Foundation Award, the Winsor & Newton Young Artist Award, the Barbara Tate Award, the Artist Editor’s Choice Award, and the Sheffield University Portrait of a Woman Award. 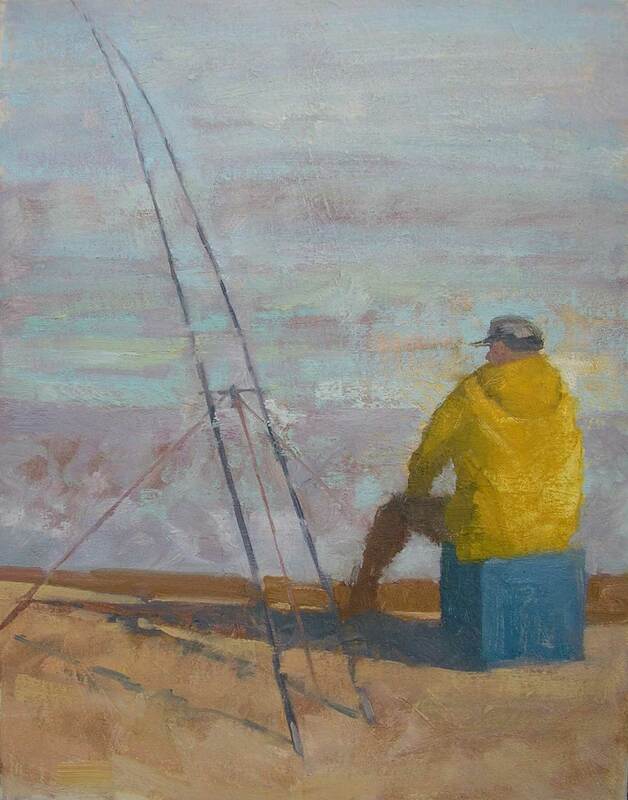 This represents just a small snapshot of the talent and diversity present within the FBA, whose societies’ breadth spans marine and wildlife art, portraiture, watercolours, pastels, oils and beyond, achieving in each genre and discipline a skill-level that is often unmatched elsewhere in contemporary British Art. 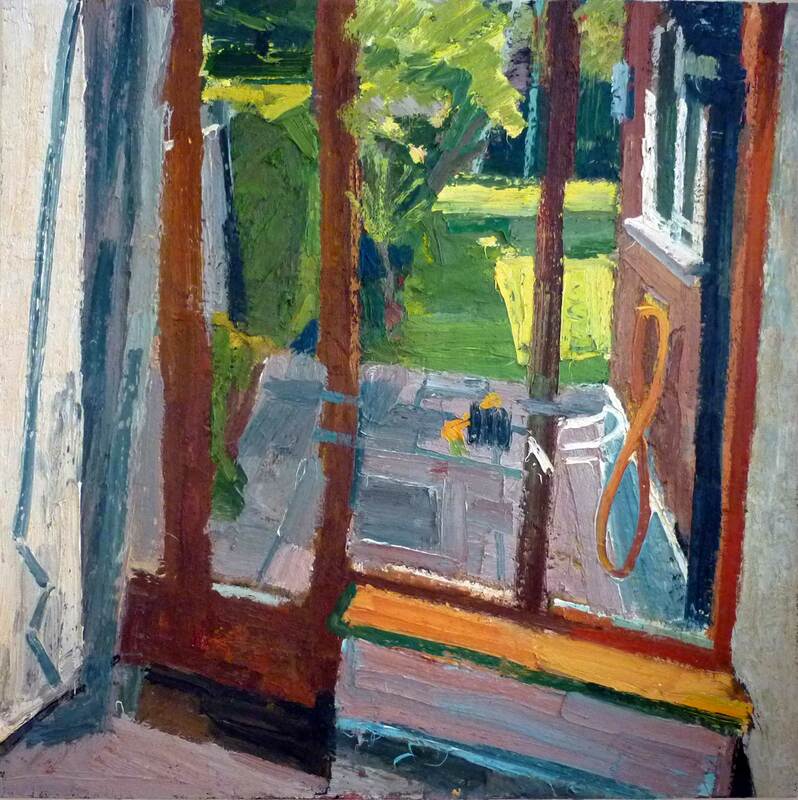 Each year, the addition of new members signals the introduction of new ideas into the Federation of British Artists. It reminds us that talented artists can hail from any backgrounds, and that having access to a vibrant artistic community remains one of the most useful resources an artist can possess. Congratulations and welcome to the new members of the FBA. If you’re an artist who would like to become a member, you can find out more about the societies and their membership application processes here. Whilst visiting the South of France in 1888, the Dutch Post-Impressionist painter Vincent van Gogh wrote to his sister: "now we are having beautiful warm, windless weather. The sun is a light that for lack of a better word I can only call yellow, bright sulphur yellow, pale lemon gold. How beautiful yellow is!" 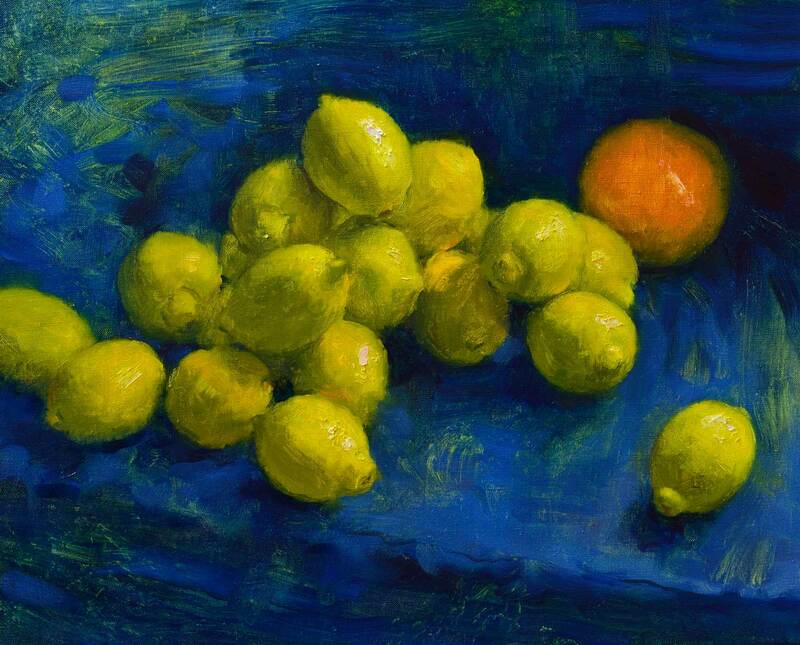 ‘Lemon gold’ is a wonderful description of the colour ‘yellow’, whose official name derives from the Old English terms for both ‘gold’ and ‘yellowish’. Like ‘lemon-gold’ and ‘gold-yellowish’, there’s a sense that this colour is understood by compounding disparate ideas which, not themselves ‘yellow’, become something closer to yellow when placed together. Perhaps part of the reason for this is that many of our best-loved yellow objects are not (strictly speaking) yellow. Van Gogh’s ‘sulphur yellow’ sun only appears so because of the incredibly high surface temperature of the sun. Casting the net wider in the natural world, things like lemons, bananas, egg yolks, daffodils and buttercups sometimes appear yellow because of a plant pigment called carotenoid. Carotenoids absorb light energy for photosynthesis and protect the green chlorophyll from photo-damage. These yellow pigments are often present in growing things, but their colour only becomes visible after photosynthesis has stopped and the amount of green chlorophyll has depleted. 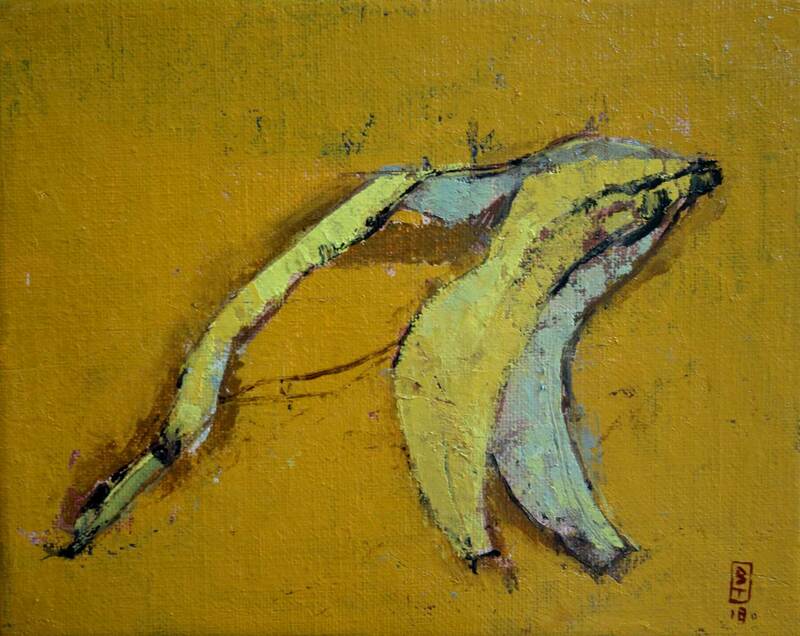 When a banana is picked, it will ripen and turn yellow. When the hours of daylight shorten in autumn, leaves lose their greenness and turn yellow. This transformation isn’t the addition of yellow, but the subtraction of another element which had been competing with it. Recent surveys carried out in Europe, Canada, and the United States found that the colour yellow is most often associated with amusement, gentleness, humour and spontaneity. In many Asian countries, it symbolises happiness, harmony and wisdom; bright yellow was once the colour of the Middle Kingdom in China, worn only by the Emperor and his household. The ancient Egyptians reserved yellow ochre for tomb paintings of the gods, who they believed possessed skin and bones of yellow gold. In a change of tack, Post-Classical Europe linked the colour yellow with Judas Iscariot, using it to mark and oppress non-Christians, such as ‘heretics’ during the Spanish Inquisition and Jews during Nazi Germany. With such a complex history, and a somewhat confusing presence in the natural world, it’s unsurprising that our sense of the colour yellow is often associative. The idea of yellow is strongly linked to other ideas, such as the sand on a beach; the vibrancy of a fisherman’s raincoat; the colour of corn growing in a field, or the yellow stone used to build Bethlehem. 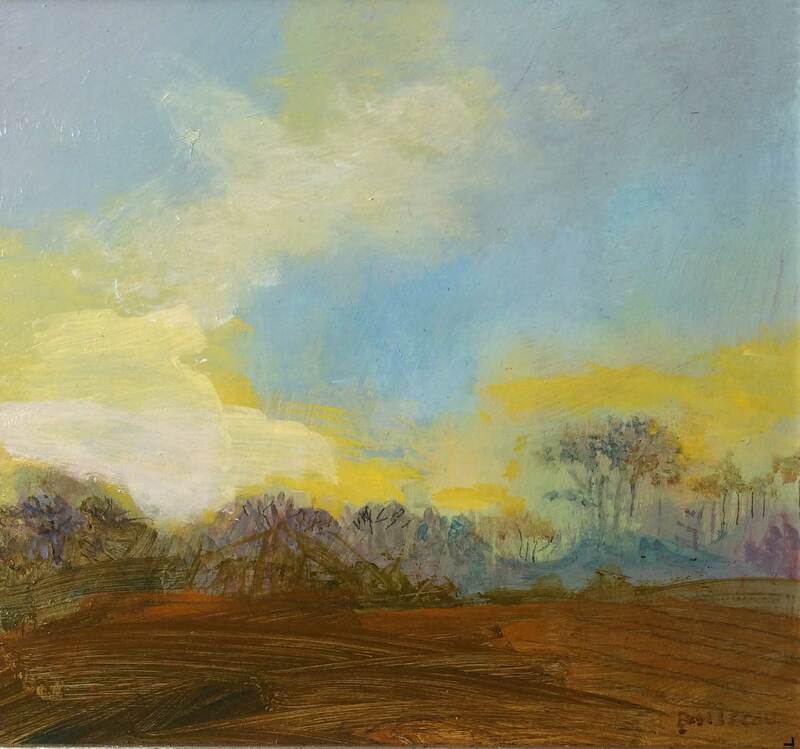 Discover yellow for yourself, and see what feelings and ideas each shade conjures up for you, in Mellow Yellow, our new selection on Buy Art | Buy Now. Our new Reception Selection features work by conservationist printmaker, Beatrice Forshall, whose practice in hand-painted drypoint engraving raises awareness about endangered species, and the dangers of animal trafficking and habitat loss around the world. 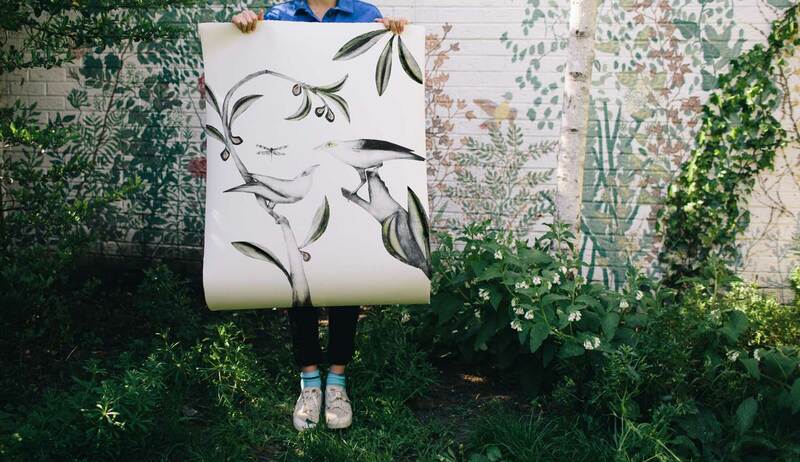 Beatrice's work features in conservation projects, publications, and in fine art prints such as those on Buy Art | Buy Now. Join us as we explore the stunning species in our new Reception Selection. The Javan Green Magpie is a song bird native to Western Java and Indonesia. It’s a member of the crow family and inhabits dense mountain forests. Born blue, it becomes green due to the yellow carotenoids in its diet of lizards, insects and frogs. In captivity, its feathers turn blue as carotenoids are destroyed by light. Loss of habitat and illegal poaching have made this bird one of the most endangered in the world, with fewer than fifty remaining in the wild. Wildlife trafficking is a multi-billion dollar industry. Bird singing competitions have become so popular that thirteen species of song bird, including the Javan Gree are now on the brink of extinction. The Grey Parrot is one of the largest parrots in Africa, famous for its intelligence & ability to mimic human speech. 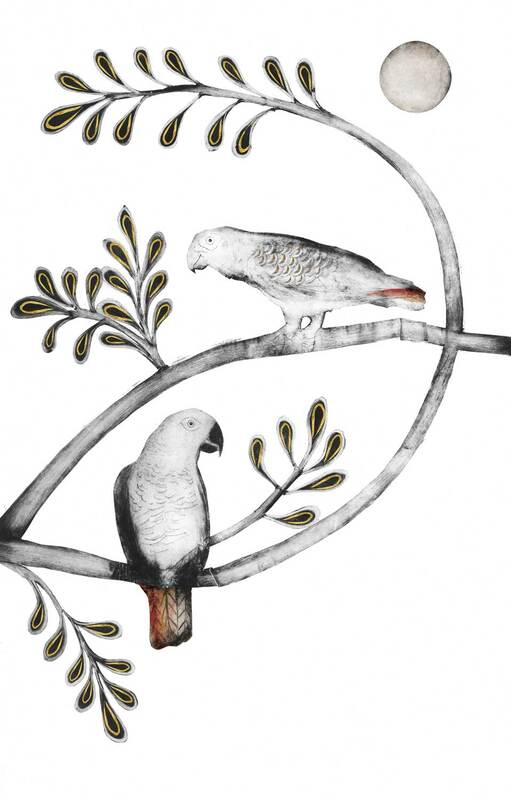 It’s the world’s most traded wild bird, and is particularly susceptible to death in captivity. It’s estimated that up to 65 % of greys die before reaching export markets. Now recognised as a separate species, the smaller Timneh Parrot is also threatened by deforestation and illegal trafficking. Measuring up to 1m in length, the Hyacinth Macaw is the world’s largest parrot and is able to fly speeds of 35 miles per hour. It’s found in Brazil and feeds off native palms, such as the bocaiuva and acuri. The latter is so hard that it cannot be eaten until pre-digested by cattle. The Hyacinth Mavaw can eat poisonous seeds and unripe fruit inedible to other species. This is thought to be possible because it swallows chunks of clay from river banks which help absorb the poisons. It is a messy eater and plays an important role as seed disperser. It mates for life and nests in holes in the mondavi tree, which it fills with sawdust. It only selects trees which are over 70 years old. It’s a sociable bird, and widow and widower macaws will seek the company of another pair. The Hyacinth Macaw is endangered because of poaching and habitat loss. The forests in which it lives are being cleared for mechanised agriculture and cattle ranching. In the 1980’s, 10,000 were taken from the wild. 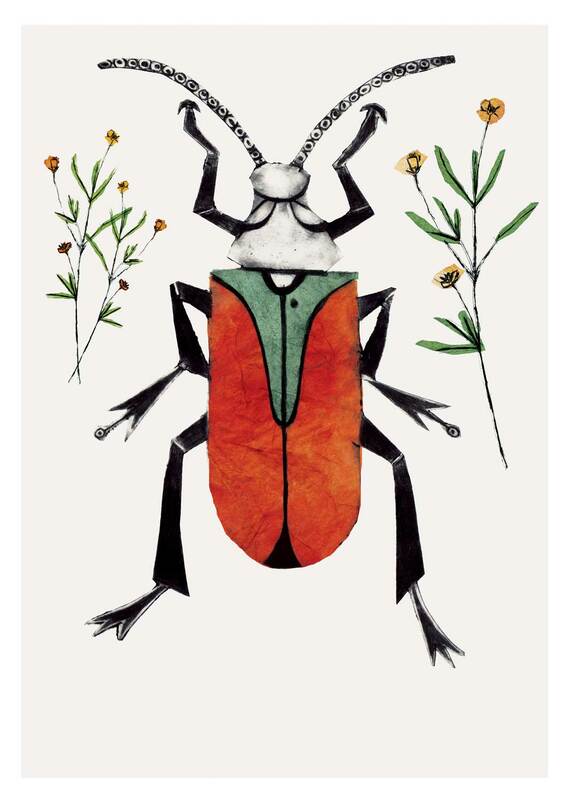 The Scarlet Malachite Beetle is one of the UK's rarest insects. It is found in just eight sites. Its decline is thought to be due to habitat loss and the intensification of agriculture. It feeds on flowers in meadows and overgrown hedgerows. Buttercup pollen is one of its favourite foods. The Black-winged Starling is the national bird of Bali. Both the Starling and the Bali Myna are native to the islands of Bali, and are two of the world’s rarest birds. Both species feed on insects, nectar and fruit, and can be found nesting together. They are highly prized for their song by collectors, and because they’re now so rare and valuable, traffickers even rob local captive breeding centres which have been set up to preserve the species. 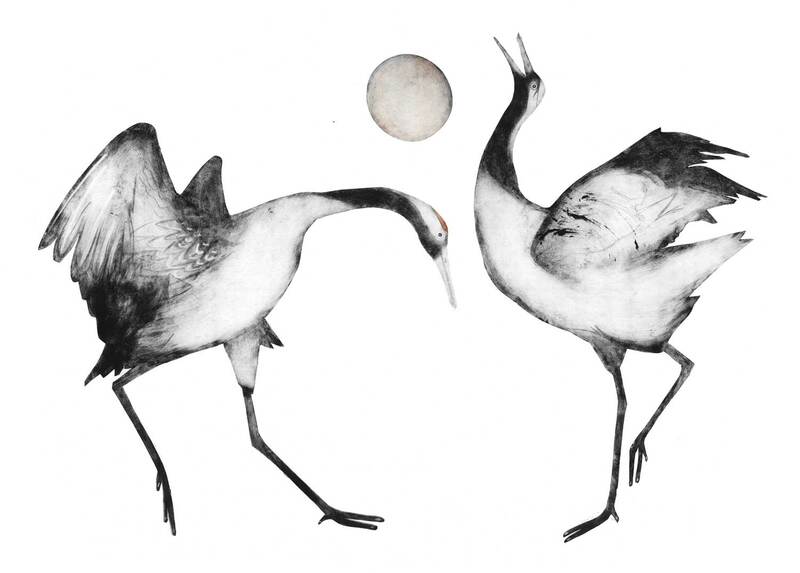 In the Orient, the Japanese crane is sacred and seen as a symbol of fidelity, love and longevity. Its wingspan measures up to 2.5 metres. Foraging in deep water, it is the most aquatic species of crane and pairs for life, performing a synchronised courtship dance. It’s found in north-eastern China, Russia, Mongolia, Korea and on the Island of Hokkaido in Northern Japan. The chicks leave their nest after only a couple of days to follow their parents on foraging trips. Due to the intensification of agriculture, industrial development, habitat loss and hunting, this species is now endangered. These works are available to view in our reception space at 17 Carlton House Terrace, SW1Y 5BD. They can also be viewed and purchased online at Buy Art | Buy Now. For more information about how we can stop wildlife trafficking, go to www.traffic.org. For more information on how we can help save Japanese Cranes, go to www.savingcranes.org. For information on how we can help save the scarlet malachite beetle, go to www.buglife.org.uk. 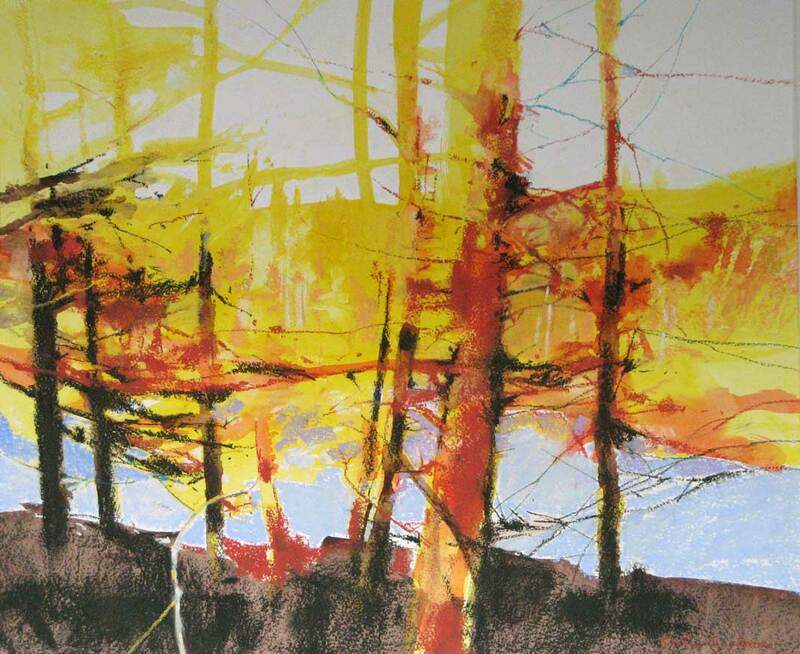 Artists have been drawn to the landscapes of Cornwall for hundreds of years. J.M.W. Turner toured the region in 1811, producing a series of watercolours depicting both picturesque coastlines, and sociological portraits of the Cornish mining industry and merchant fleet. After Turner came American artist J.A.M. Whistler, who visited Cornwall in 1884 with Walter Sickert, an influential member of the Camden Town Group. 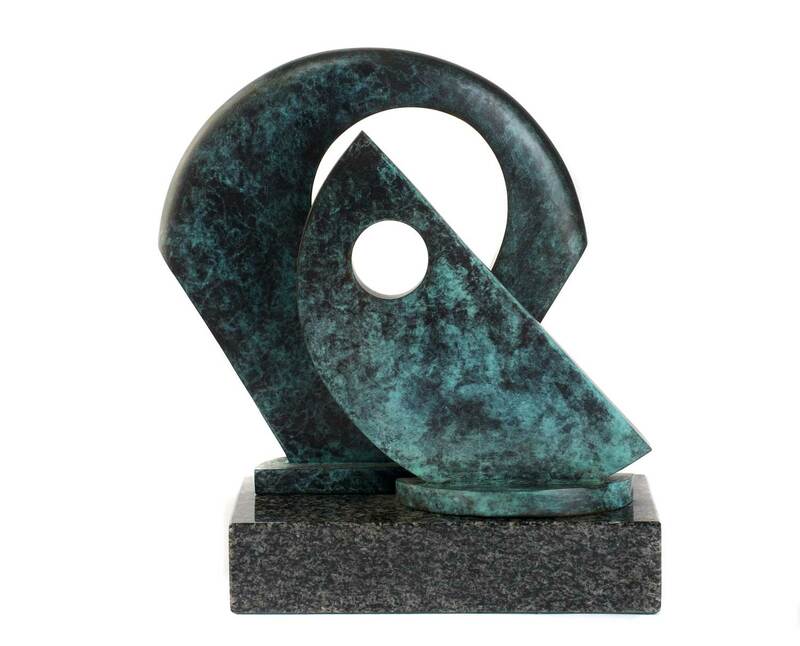 The Twentieth Century then saw key figures such as Barbara Hepworth, Naum Gabo, and Patrick Heron settle in Cornwall to live and work. The creative community that emerged was dynamic and world-leading, and its spirit continues today. 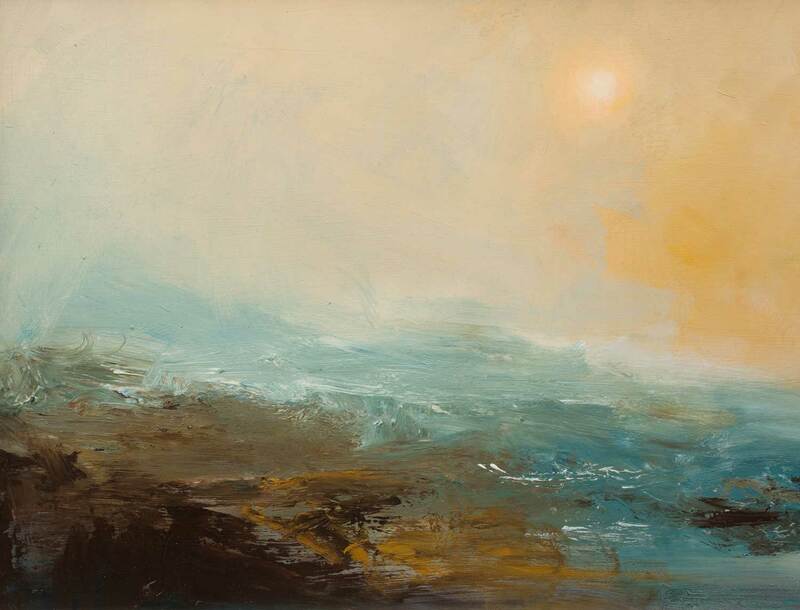 Colin Allbrook RSMA RI emulates Turner’s twin interest in the romantic and the anthropological with his Cornish cliff scenes, in which natural beauty mingles with traces of Cornwall’s mining past. 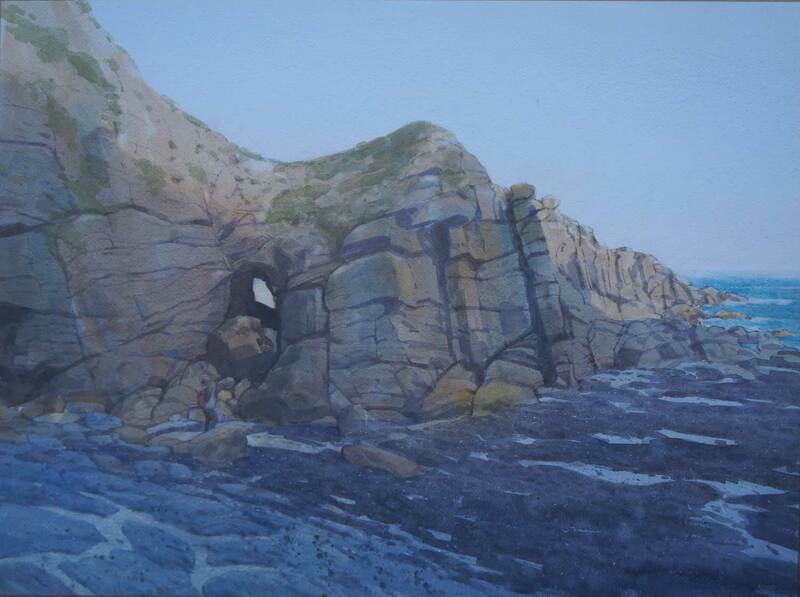 At first sight, The Tunnel - Porthgwarra appears to be an homage in watercolour to the dramatic geology of the region; the contours of the rock face, which dominate the composition, stretch and twist like a monumental muscle. Yet in the heart of the rock we see a tunnel, visible only at low tide, forged by the miners who once worked here, whose mark is indelibly left upon the landscape. 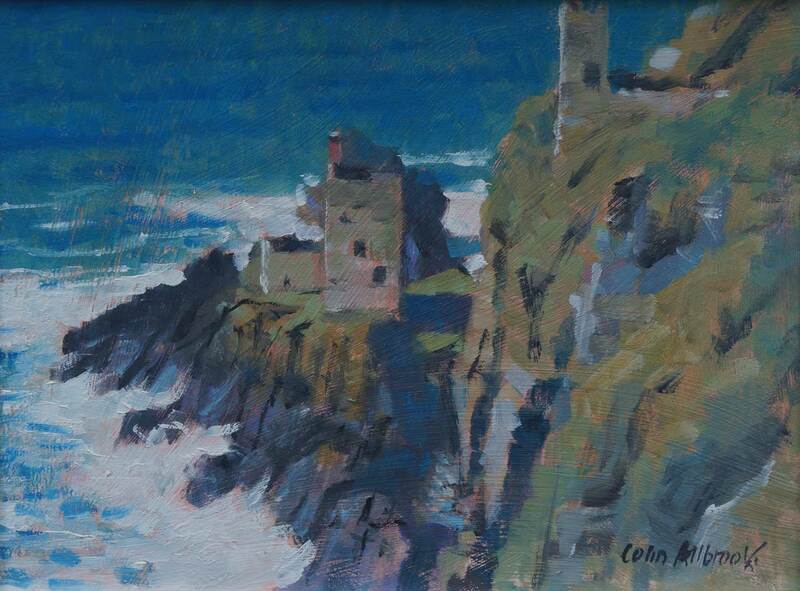 Allbrook produces a similar effect in Tin Mines - Botallack, where square stippling brush strokes in greens, browns and mauve cause the verdant cliffs to merge with the miners’ huts perched above. It is not immediately evident that this remote spot has been touched by heavy industry, and on discerning these structures, Allbrook reassures us through his colour palette that there is harmony here between the manmade and the natural. 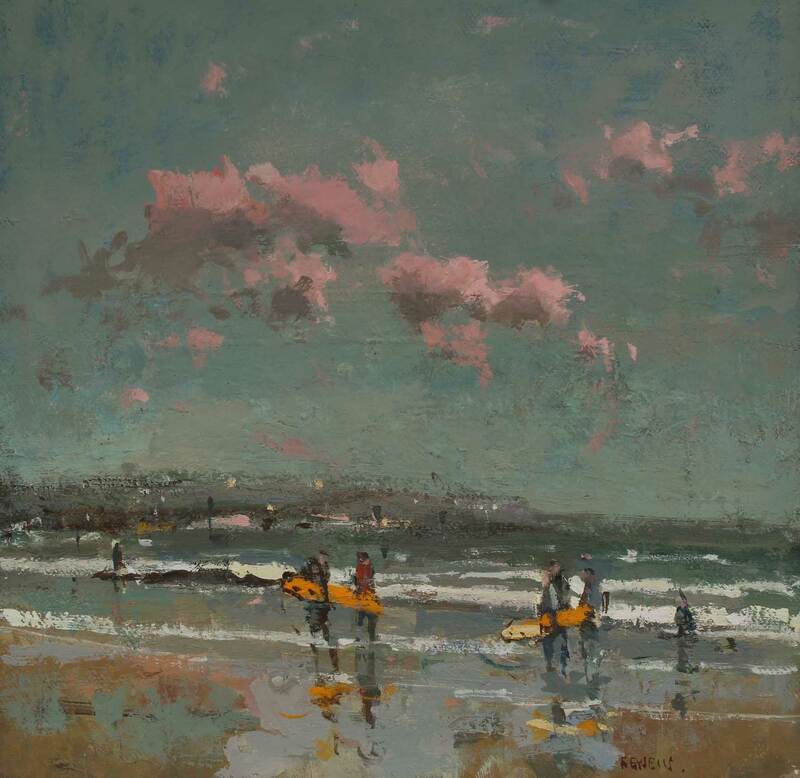 Cornwall by Robert E Wells RBA NEAC shares this sense of peaceful co-existence, with waves lapping gently at the feet of surfers strolling along Travone beach, a scattering of clouds like so much pink candyfloss in the background. 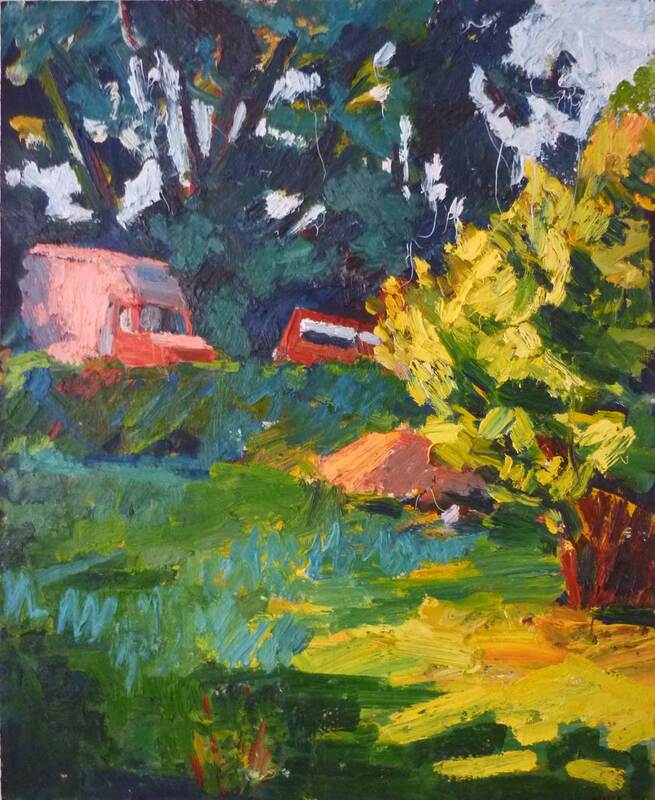 Peter Clossick NEAC portrays the environment tamed yet further in Arch Farm, Cornwall, where bright splashes of yellow and red, on the tree in the foreground and the vehicle in the background, evoke a sense of vibrant fertility in this cultivated space. 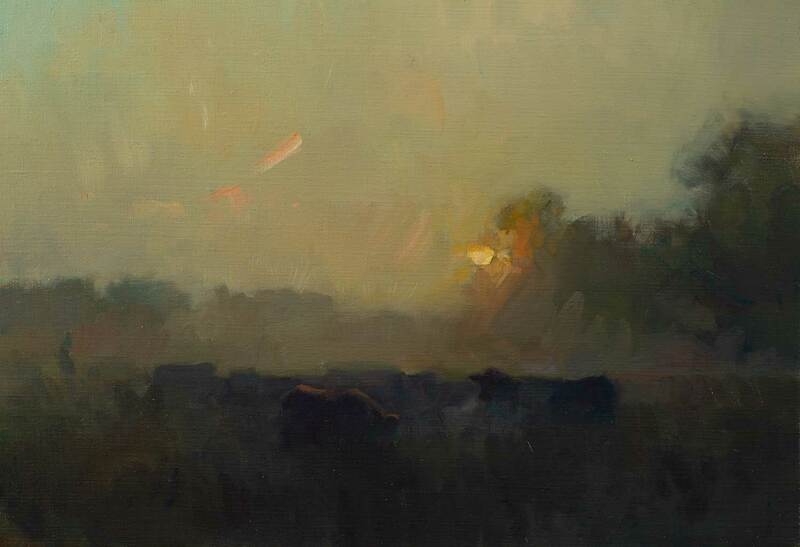 In contrast, Lucinda Storm’s coastal skyscapes leave no question as to the supremacy of the natural world. Vast and brooding skies are reflected in the mirror of the sea below, creating a fearsome reciprocity of elemental power, which leaves the viewer little room for self-aggrandisement. 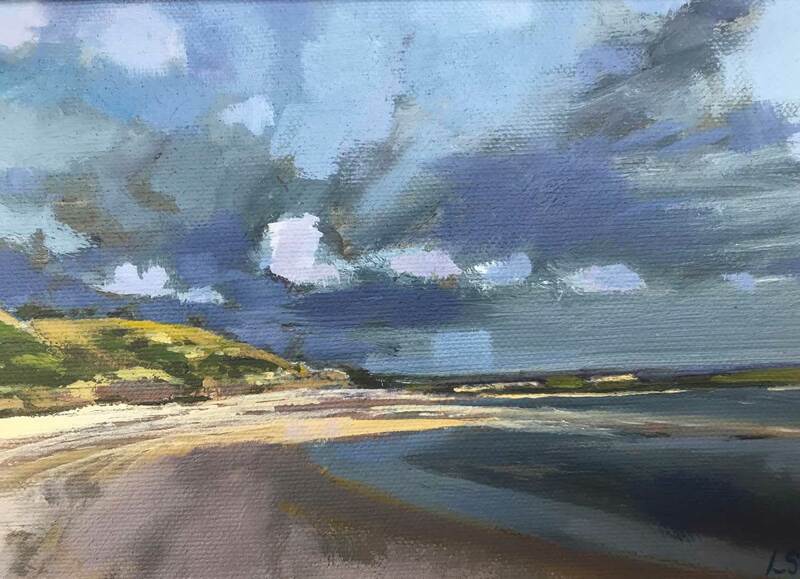 One must instead share the artist’s sense of awe, and her appreciation for the refraction of light upon water that gives these Cornish scenes a spellbinding quality. 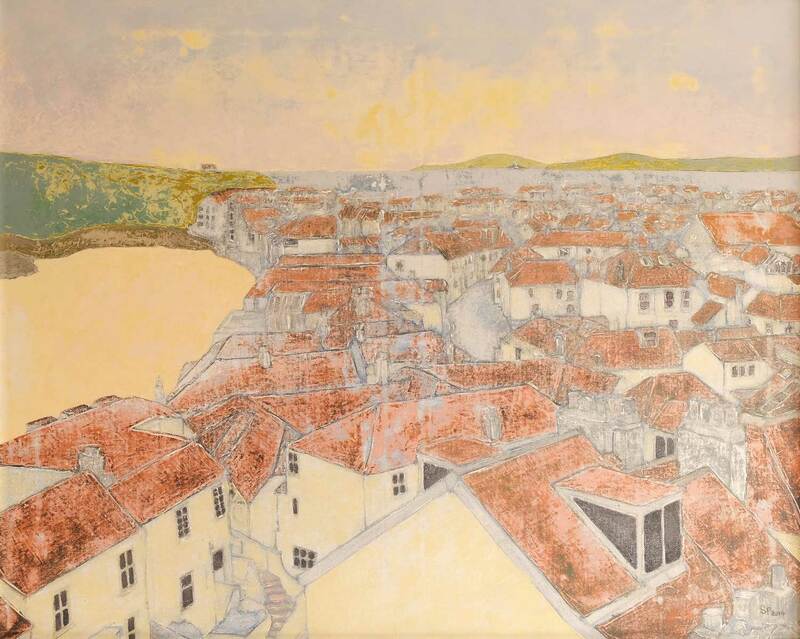 Whether hostile and awe-inspiring or picturesque and romantic, peopled, uninhabitable, or bearing the marks of historic use, this selection of Cornish scenes by contemporary artists gestures to the manifold responses which have inspired so many works of art, and art movements, whose origins lie in this often-overlooked region of the UK. 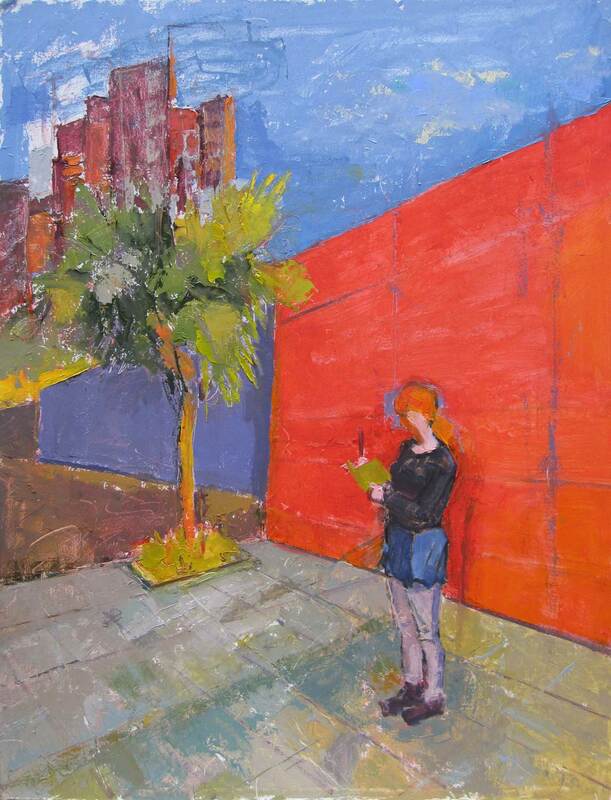 Mall Galleries steps into the creative world of artist, Eve Pettitt, to discuss colour, the beauty of the female form, and the joy of painting. 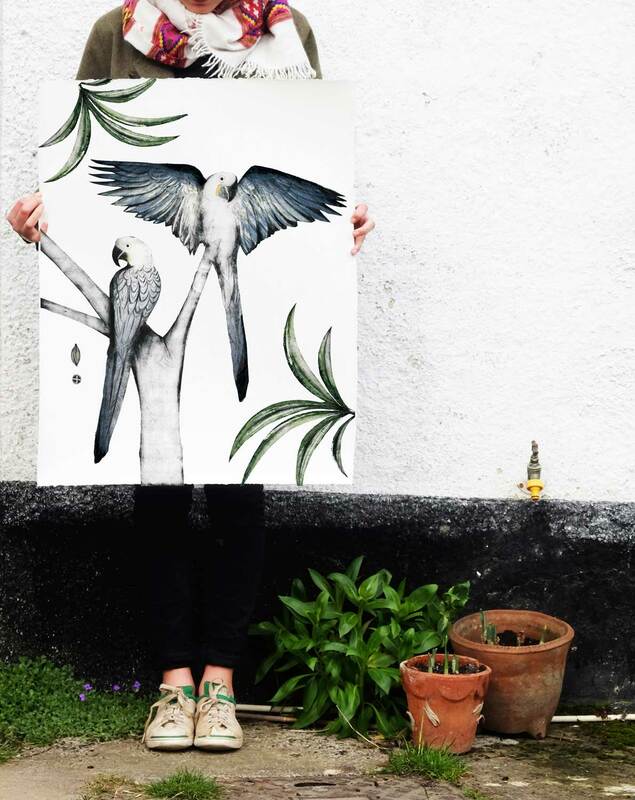 Find work by Eve Pettitt at Mall Galleries Buy Art | Buy Now.